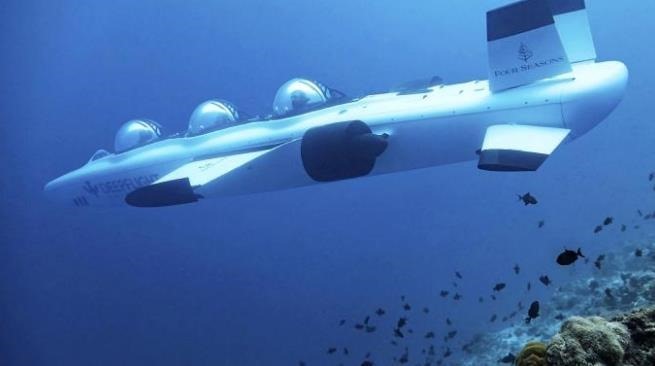 A one-hour trip for two costs $1,500 (£1,100) plus tax. Who put the “French” in French toast? 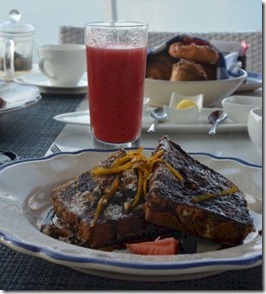 I’m always surprised there is not more brioche served in the Maldives at the high end resorts. It is a truly elegant bread. A staple with the delicacy of foie gras. And often the way the trendy London gourmet burger bistros decadently dress up their ground beef in order to charge $30 for it. 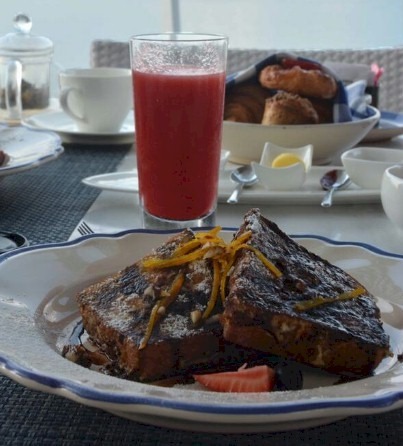 A bit of research found that Gili Lankanfushi also serves brioche French toast, but I will give this nosh nod to Landaa for their mouth watering treat tweet. 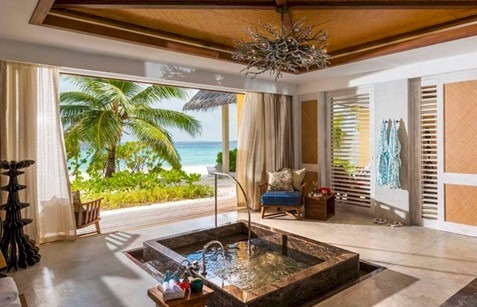 In the opulent designs of the Maldives resorts, the pools themselves can be objets d’art themselves. One of the most spectacular is Four Seasons Landaa Giraavaru’s Three Bedroom Estate’s pool. A two-tier construction with the upper pool sheltered under a thatched roof (see above) overflowing to form a waterfall to the one below (see below). Sort of a tropical variation of Frank Lloyd Wright’s “Falling Water”. 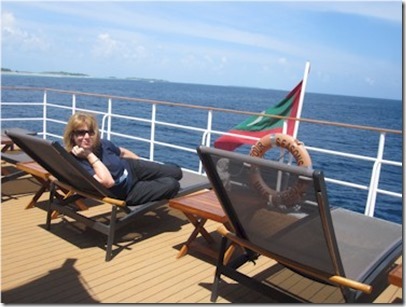 Maldives Complete also doesn’t do boats in its profiles or ‘Best of’ reviews. 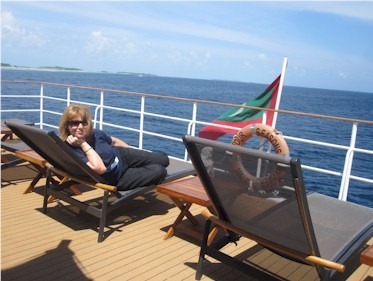 I’ve shied away from getting into the whole ‘Live Aboard’ segment of Maldives holidays because, like Guest Houses, I’ve never been on one so I wouldn’t know which criteria to feature or how to write about it. But, this post’s distinction is sort of a resort/cruise hybrid so it just passes. It’s sort of the ultimate water villa. A mobile water villa. We have always fantasized about taking a cruise boat actually as a way to see lots of nooks and crannies of this mystical archipelago. 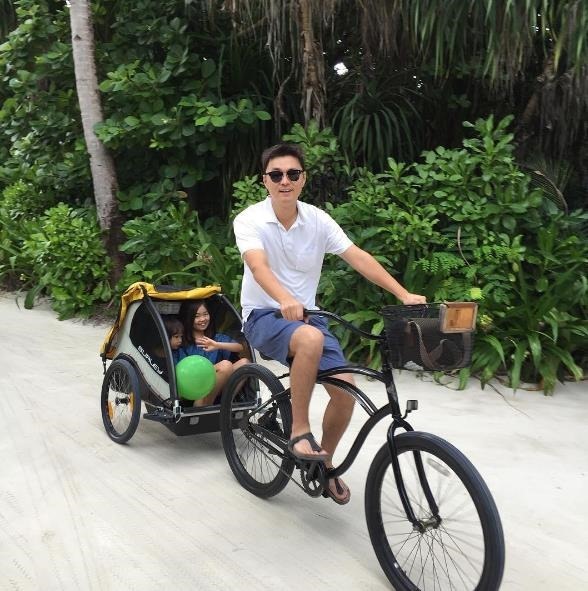 Having been to many resorts and enjoying the discovery of new gems, the notion of touring along a stopping at all sorts of little islands off the beaten path and then retiring to the ultimate in ‘water villas’ sounded entrancing. 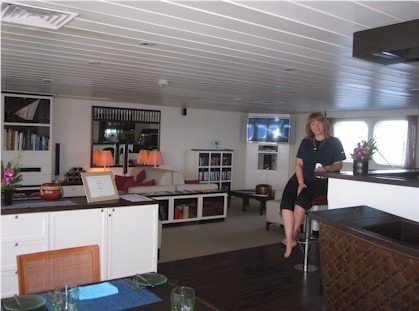 If you ever wanted to try out the mega-yacht life for the experience of your very own (ever see those gigantic yachts parked in swish harbours with ports of call on their bow for ‘C.I.’ and ‘V.I.’ and wonder what staying on them would be like?). If you’ve ever thought of going beyond even the picnic island excursions of resorts to the most secluded and far flung hidden parts of the Maldives strung together like your own customised ‘virtual’ resort. 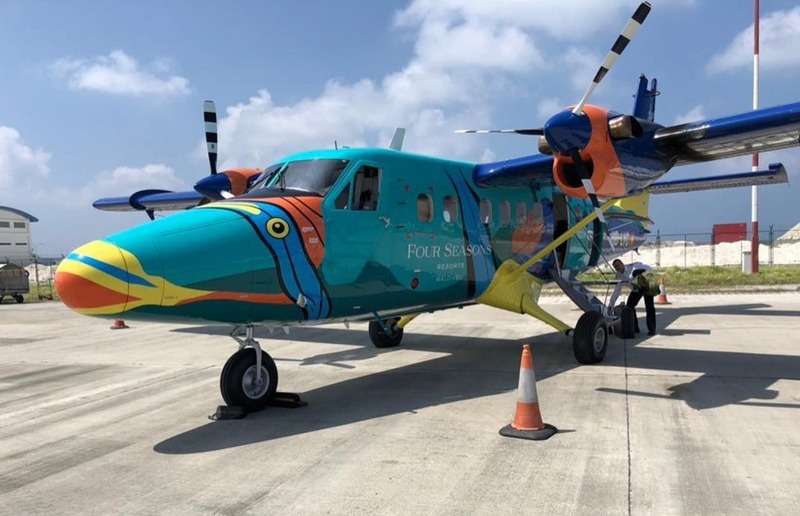 Well, any of these have crossed your mind, then the Four Seasons has an offer for you with their Four Seasons combo offer on the exquisite Four Seasons Explorer offers a brilliant option. Another possible title for this post is “Billionaire for a Week”. Like my “Billionaire for a Day” post. The price of chartering the Four Seasons Explorer is $16,000 per day (last I checked) for whole yacht. For 22 people that’s a bit over £500 per day which isn’t exactly billionaire price bracket. But it certainly is the billionaire lifestyle. 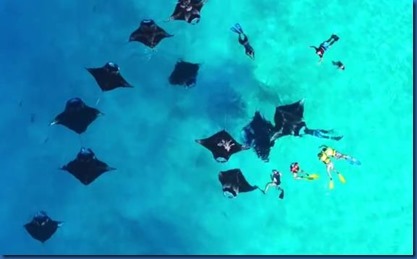 The Four Seasons have always had a website that allowed you to look up your Reefscaper coral frame and see how it was progressing, but now they have just relaunched a special website, Marine Savers, to provide not only frame update lookups, but also detailed information and updates on the ever broading range of their Maldives-leading conservation initiatives. 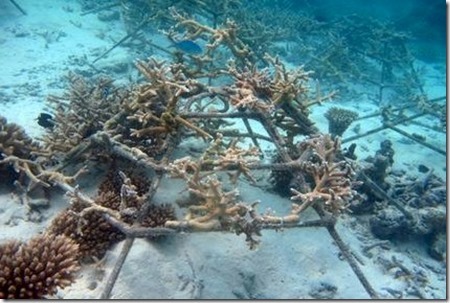 Above is our frame (KH0327) we planted in November 2010 at Four Seasons Kuda Huraa. Toddler-sized growths are looking pretty attractive compared to the collection of broken pieces that we affixed to the iron frame. Curiously, our frame (LG0729) planted during our visit to Four Seasons Landaa Giraavaru that same week is doing notably less well, but still clear healthy growth from the fragments first affixed. The arrival jetty is a just one step of an august procession of anticipation when arriving at a Maldives resort. It starts with spying the first splotch of turquoise out your airplane window. 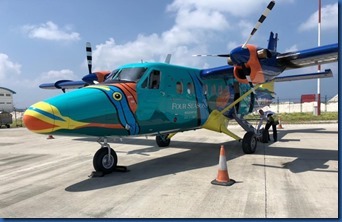 It continues boarding your transfer boat/seaplane where you spy a few colourful fish frolicking around the jetty. Your heartbeat picks up when you see the green dot of an island emerge on the horizon. 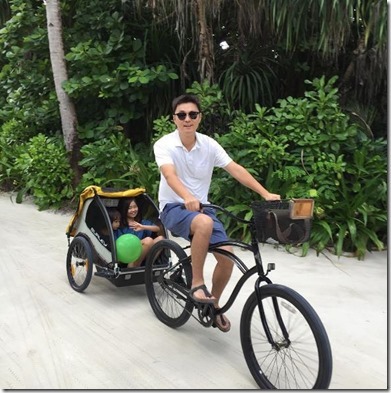 You pull up to the resort jetty welcomed by cool scented cloth, refreshing tropical concoctions and warm smiles. Then you make tke the long walk down the jetty towards reception seeing even more lively and colourful fish circling beneath you. At most resorts, the reception greets you at the end of the jetty. 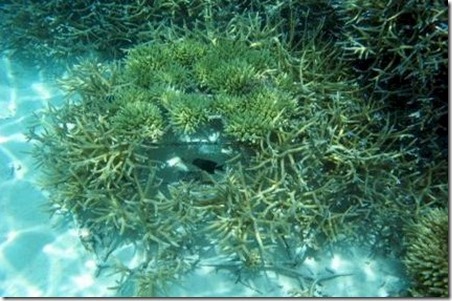 But a Four Seasons Landaa Giraavaru, the expectation builds further as you first arrive to their entrance boulevard. 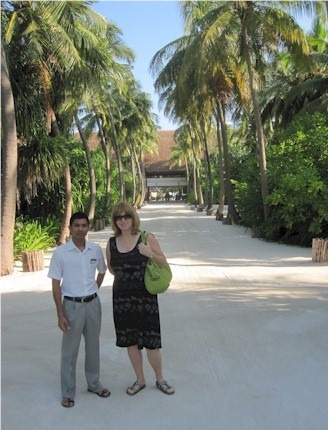 A grand avenue of coconut tress planted by the previous Maldivian owner leading into the island interior. Dubbed ‘Coconut Corridor’, it adds even more buil up to the big arrival. 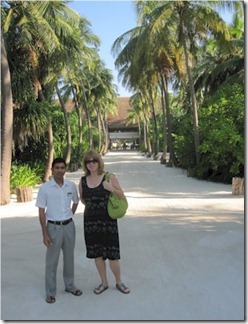 Along with Club Med Kani, one of the great palm corridors of the Maldives.